Buying a new car can be intimidating. Frankly, what you don’t know can hurt you. We asked automotive expert and former dealership owner Christina Selter of HerHighway.com to share her car-buying tips. When shopping for a new car, make sure you determine how much you can spend on it. AAA’s financial services experts advise allocating no more than 15 to 20 percent of your total monthly budget to car-related expenses. Don’t forget to factor in the cost of car insurance in addition to your monthly car payment. You probably know you can use online resources like Edmunds.com to find out what the dealer paid for your car, but did you know you can also ask the salesperson for this information directly? Christina Selter, editor of women’s automotive site HerHighway.com and a former auto dealer herself, says the dealer must provide the dealer’s price vs. the manufacturer’s suggested retail price (MSRP) upon request. So how much more than dealer price should you expect to pay? Selter suggests asking the dealer to sell you the car for $500 over the dealer price. “They don’t have to sell it for that price,” she explains, but it’s a good place to start negotiations. Before jumping into the driver’s seat for a test-drive, decide on the type of financing you’d like to use (loan, lease or cash). If you’ll be going for a loan or lease, arrange for financing ahead of time. Compare rates offered by your own bank or credit union as well as other local banks to secure the most favorable terms. While you’ll probably get more money for your old car if you sell it yourself, you may not want to deal with the hassle. If you’re planning to trade in your used vehicle, make sure you know its trade-in value. Use websites like Kelley Blue Book and AutoTrader.com to zero in on a number. “It’s best to do research in advance of visiting the dealership,” explains Selter. Use manufacturer websites and sites like Edmunds and HerHighway to read reviews, determine the options for the model you’re shopping for and evaluate pricing. Selter also suggests calling the dealership prior to your visit to make sure it has the make and model you’re looking for on the lot. Take your time when shopping for a new car. She recommends visiting more than once and thoroughly researching the vehicle prior to committing to the purchase. 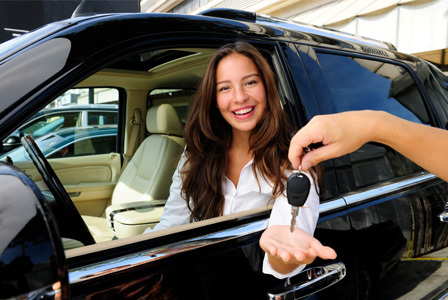 Make sure you’re comfortable with the dealership where you intend to purchase your vehicle. “You want to be sure it’s the car you want and that you are buying if from the salesperson and dealer that will take care of you even after you write the check,” says Selter. A test-drive is the best way to find out how a new car looks, feels and drives. Selter suggests taking the first test-drive by yourself and bringing the whole family (and all their car seats) on a follow-up test-drive. This will give you an opportunity to make sure everything (and everyone) fits comfortably. In an effort to reduce weight and increase fuel efficiency, auto manufacturers are choosing to skip the full-sized spare tire in many new cars. While you may laugh at the thought of changing your own flat tire (or not — find out how), it’s still good to know if you have a spare on board. Ask the salesperson to show you if there’s a full-sized spare, a temporary spare or a tire-repair kit or whether your car is equipped with run-flat tires (in which case, no spare tire will be provided). Before you take possession of your new car, give it a detailed inspection, both inside and out. Check for any damage or unexpected wear and tear. Address any concerns with the salesperson before handing over a check. Print out the Consumer Reports new car delivery checklist and use it to fully inspect your vehicle before leaving the dealership.